Nutrition for Health and Healthcare 5 Edition Current, practical information in a real-world context for future nurses and health care professionals. 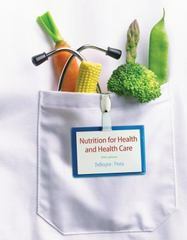 Designed for the clinical nutrition and/or diet therapy nutrition course, NUTRITION FOR HEALTH AND HEALTH CARE is a trusted text that demonstrates the important role of nutrition to future nurses and health care professionals in their future careers. The text begins by covering basic nutrition concepts and proceeds with clinical topics organized by organ systems, linking nutrition to different disease states, such as diabetes, renal disease, and liver disorders. Each chapter includes practical information, current research, and clinical practice guidelines for addressing nutrition concerns and incorporating nutrition into care plans. Valuable supplements accompany this text to help instructors prepare for class and to help students succeed in their course.